Head of the press service of the Ukrainian Orthodox Church (UOC) Vasily Anisimov believes that by requesting autocephaly for a Ukrainian Orthodox patriarchate from His All-Holiness Ecumenical Patriarch Bartholomew, Ukrainian President Petro Poroshenko is playing with fire. “Petro Poroshenko is tempting Patriarch Bartholomew as the devil did Christ. His predecessors did the same. They are tempting him to create pan-Orthodox discord in the world and religious conflict in Ukraine,” Anisimov said in an interview with Orthodox radio station “Radonezh,” reports Interfax-Religion. 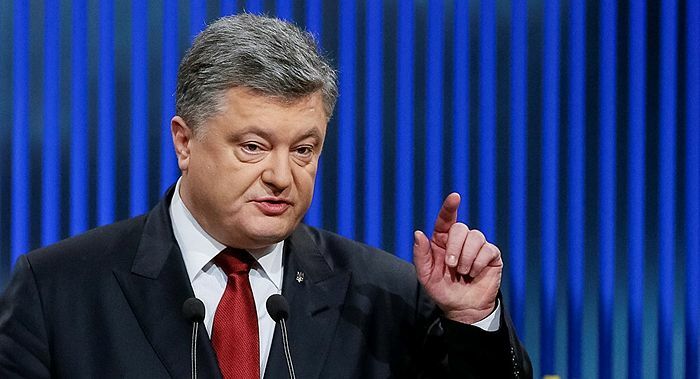 After meeting with the patriarch in the Phanar recently, Poroshenko returned to Ukraine and called again for the creation of a united autocephalous Ukrainian Church that would not be connected to the Moscow Patriarchate, as is the canonical Ukrainian Orthodox Church. The Ukrainian parliament supported the president’s initiative, as did the hierarchs of Ukraine’s two schismatic Orthodox bodies, and a Ukrainian politician immediately took the plea to Constantinople. Various Ukrainian schismatic-nationalist groups have been seizing parishes of the canonical Orthodox Church and physically attacking their priests and parishioners for years. In the wake of Poroshenko’s call for a united Ukrainian Church, various groups have announced that they took the president’s call as his blessing for them to ramp up their demonically-inspired activities. “Instead of peace, the authorities are creating new points of confrontation in society,” the UOC speaker added. Not all Ukrainian deputies supported the president’s incursion into Church affairs, and they sent their own appeal to the Ecumenical Patriarch to pray for Ukraine but to ignore the president’s plea. The canonical Ukrainian Orthodox Church has also not supported the president’s overstep, as its hierarchs value the unity of the Orthodox Church before Ukrainian nationalism. Furthermore, Anisimov also believes that the Ecumenical Patriarch behaves inconsistently, on one hand calling for an end to the fratricidal war in Donbass, and on the other receiving the “Uniate hawk Parubiy,” the speaker of the Ukrainian parliament, which recently voted to support Poroshenko’s call for a united autocephalous Ukrainian Church—a move motivated by anti-Russian sentiments. “He himself teaches us that the Unia is ‘an ecclesiological heresy, having no right to exist in Christianity,’—so why welcome him?” Anisimov asks.